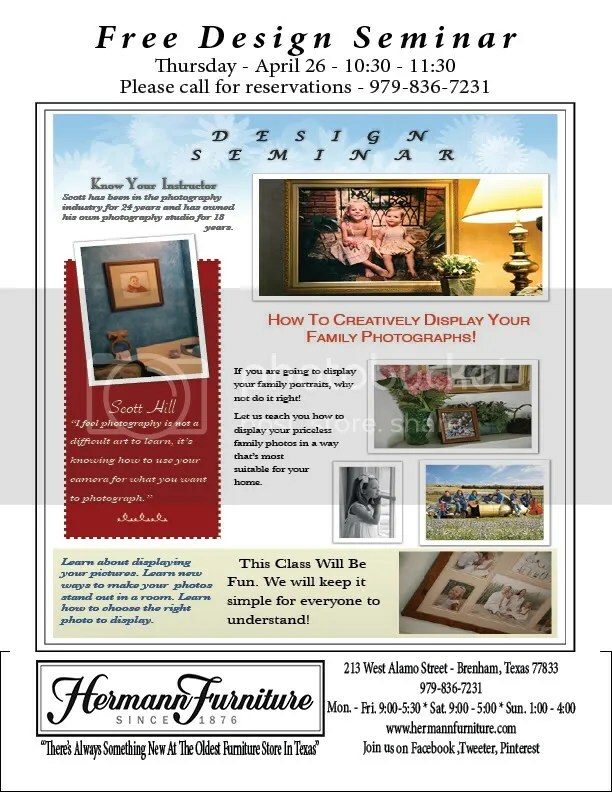 Hermann Furniture in Downtown Brenham together with Scott Hill Photography is hosting a design seminar. Scott is a locally renowned photographer whose charm, wit and talent will make this fun and highly informative for the novice or the semi-professional. Not only will you come away with a better understanding of placing your photos and why, but you will be wowed by what’s new at Hermann’s. I will be following up with some pics of vignettes from the store for you to see. Don’t miss this one! And, while you are downtown don’t forget lunch at Funky Art Cafe…so good! Next Post Hermann’s: What’s New?